The list of what the High Priest should wear when carrying out his duties is long and detailed. The Hoshen (a breastplate); The Ephod, a kind of tunic made with gold, blue, purple and scarlet, fine twisted linen threads. It would have two onyx stones, each engraved with six of the names of the tribes of Israel, and they would be embedded in a gold setting on the shoulders of the garment; A gold frontlet to be worn on the forehead, with the inscription “Kodesh l’Adonai” (Holy to God); A fringed tunic, a headdress, a sash, and linen trousers. The Hoshen was fixed by chains to the shoulders of the ephod and carefully connected, the urim and tumim were placed within it, and twelve different precious stones arranged in four rows of three, one for each of the tribes of Israel. The clothing was fringed, with pomegranates and golden bells around the hem of the robe so that it would make a sound when the High Priest walked in the sanctuary, and people would be able to hear him. If all this sounds a little familiar, it is because we dress our scrolls in similar fashion. Tunics of rich materials, beautifully embroidered; crowns and bells – called rimonim, pomegranates, that tinkle when we carry it; a breastplate – hoshen. Several times we are told that the High Priest’s clothes are for honour and beauty – kavod v’tiferet. And we have taken from this the idea of adorning our synagogues and Sifrei torah for the same purpose – hiddur mitzvah – beautifying a mitzvah -being the principle behind the decoration of our ritual objects, about the three statutory meals on Shabbat, about creating an aesthetic in our lives that not only glorifies God but makes us more aware of the beauty of our world. It was, at first, the two engraved stones on the shoulders of the ephod – “avnei zikaron” – “stones of remembrance” that I noticed – avnei zikaron. I have recently returned from Lausanne, where with my brother and sister we dedicated a new stone on the grave of my grandfather, who had died there from damages he had originally acquired in Dachau. Having eventually got to a clinic in Switzerland, stateless and without access to any of his assets, he had died and been buried by the community there. My grandmother had arranged a stone to mark the grave, my father had had it repaired, but on a recent visit we saw that his grave was essentially unmarked – the composite the stone had been made from had not held the letters of his name. Here, to all intents and purposes, lay the body of an unknown man. We arranged a stone to go onto his grave, and while the stone on a grave is usually called in Hebrew a “matzevah”, from the standing stone marking the grave of the matriarch Rachel, this felt more like an even zikaron, a stone to provoke memory. We felt it was important to not only mark the grave and give our grandfather back his name, but to create something that would cause an onlooker to think about him and to learn something of his essence. So we added his title – Landgerichstrat – County Court Judge. And we added the name of my grandmother buried in Lugano, of my father buried in Bradford, and the name of his aunt Helene who died in Theresienstadt. We added the dates of their lives, their relationship to my grandfather and the places where they were born and died. And at the foot of the stone is the acronym found on so many Jewish graves – taf nun tzaddi beit hei – t’hi nishmato tzrurah bitzrur ha’hayim – may their souls be bound up on the threads of life. Seventy years after his death, we, his descendants whom he never knew and could not even have imagined, found great meaning in creating for him an even zikaron – a memorial stone that not only gave him back his name, but in some way brought him back into the fabric of life. It gave him a measure of dignity; it recorded that here lay a man who loved and was loved, who had had learning and held a respected career, whose family had become scattered – and worse – because of forces we can still not really understand. So much memory was encapsulated in the engraving. Four names and their relationship to the man lying there. A status in society; six towns in four different countries. We stood around that snowy grave under a winter sun and told family stories, traced the journey that had led this man whose family had been in the Lower Saxony area for hundreds of years, to a lonely grave far from those who had loved him. We remembered our father whose yahrzeit, like that of his father, fell that week and how, through him, we had come to know and root ourselves in a world that no longer really exists, yet continues in memory, in some artefacts, and in words. I have consecrated many gravestones in cemeteries in several countries on different continents, as well as memorial plaques in libraries and synagogues – of family, friends and congregants. But I never understood as I understood then the power of a stone that records and remembers when all else seems to have passed into history, the power of avnei zikaron. The stones on the breastplate of the High Priest that kept the twelve tribes of Israel before the gaze of God also had the effect of reminding the priest that his service to God was in the name of and on behalf of every single Israelite. And the Midrash tells us that they were avnei zikaron not only in order that God would remember, but that the Priests would remember. The Stolpersteine project is another way to keep alive those whose memory was almost entirely obliterated. The artist Gunter Demnig began a project in 1992 to remember the victims of National Socialism, by installing commemorative brass plaques in the pavements of their last address of choice. The ordinary cobblestones on the pavements outside their homes are replaced, putting in their place stones with a plaque that bears a simple inscription – the name, date of birth and the date and place of death, if known of each individual. One stone per person. The stones are positioned outside the houses of Jews, Roma, Sinti and others who were murdered by the Nazi regime. Stolpersteine, stumbling stones, can be found in Germany, Austria, France, Hungary the Netherlands, Belgium the Czech republic, Norway, Italy, the Ukraine, Greece, Sweden, Denmark, Finland and more recently Spain…. What began as a mainly artistic endeavour has turned into a powerful aid for people to create memory, to bring back to life in some way those who disappeared, murdered, their bodies unburied and desecrated. It is a measure of the power of this project that to get one installed will take well over a year, so long is the waiting list of those who wish to commemorate family. The original meaning of the word stolpersteine used to be “an obstacle”, something that prevented you getting to your goal; but that has changed, the focus is drawn to the immediate now rather than on the horizon. They are designed to provoke thought, to make us see the world around us a little differently for a moment, as the people who once walked those streets until taken away and murdered, come to focus and live for us for a short while. So now one stumbles over the stone in the pavement and stops, reads, thinks of the individuals and the families who lived in the house or apartment adjacent. Tragically they are also the focus of those who do not want to be reminded, do not want to accept any role in remembering. We know that in December last year twenty of them, which commemorated members of two Italian Jewish families – the Di Consiglio family and the Di Castro family – were hacked out and stolen in Rome, others have been defaced or vandalised. We are told that the High Priest Aaron wore bells on his clothing so that he didn’t die. It is not really clear how death was prevented, but what is clear is that the people could hear him moving around in that sacred space. People being aware of him somehow kept him from death. It is our memories and the stories we tell of those we love that keep them living in some very real way. Their bodies may die but the memory lives on strongly. And the best way we can keep their memory in public attention is to inscribe it on a stone – their names, relevant dates, reminders of the person they were, reminders that they had lived a life, had been bound up in the threads of a fabric in which we too are bound up. The Avnei Zikaron in the clothing of the High Priest were there primarily to remind both God and human beings of the importance of our history together, of the relationship to each other that has given meaning to both parties. Stones of memory mean that as long as we will not forget each other we won’t completely die, and that when we die we will not be completely forgotten. And that matters. 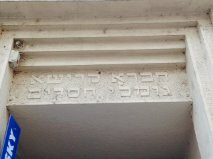 The acronym “taf nun tzaddi beit hei” is found on Jewish graves the world over, and refers to the idea that the life being recorded here is not completely ended, but its threads are connected to the continuing future – be it through descendants or stories, be it through the impact the person had on others, their teachings, their behaviour, their actions. After we had recited the psalms, sung the El Malei Rachamim, spoken the words of Kaddish Yatom the mourners kaddish, after we had shared memories and stories of a man we never knew except through his impact on our father, and stories and memories of our father, our grandmother, and the elderly woman murdered in Theresienstadt after 80 years of life in a quiet village tending the family synagogue and the family shop, we bent down and placed on my grandfather’s grave some small stones, one for each of us, one for our parents, and one for each of our children. And then one for the soon to be born baby of the next generation of our family. Stones put down on sacred space as avnei zikaron, for life goes on. Confronting the reality of death is always hard, and for Abraham this is no exception. The text that begins with the phrase “the life of Sarah was one hundred and twenty and seven years, these were the years of the life of Sarah, and Sarah died…” is the introduction to a protracted negotiation for her burial place. In the twenty verses of the narrative, only three touch on Abraham’s emotional state “Abraham came to mourn for Sarah, and to weep for her. And Abraham rose up from before his dead, and spoke unto the children of Heth, saying: I am a stranger and a sojourner with you: give me a possession of a burying-place with you, that I may bury my dead out of my sight.’ In the story as first presented we see that he seems to quickly move from mourning and weeping to making the practical arrangements so that the body of his wife can be buried and removed from before him. Sarah’s is the first documented burial in bible – up until now the narrative has dispassionately informed us of the death of individuals without much more detail. Yet clearly this burial he is arranging is not an unknown rite. The children of Heth recognise his need and open the negotiations with the offer that he may take his choice from their sepulchres, telling him that no one would withhold their own plot from him should he want to use it. So clearly there was already a well- established proactive structure in place of prepared graves by the time Sarah died, not surprising given the need to quickly dispose of the bodies of the dead. Yet our foundational family did not seem to have made this provision. Was it because as an immigrant family they had not got a sense of ‘owning’ the land they had come to? Or because they had not quite struck roots in the land of Canaan and were still travelling? It is odd that Sarah died in Hebron when Abraham was clearly in Be’er sheva. Were they living separately? The midrash tells of Sarah’s death being caused by her horror that her husband would be prepared to sacrifice their son so had she left Abraham in order to strike out alone? Was any previous plan to have a grave left behind in the tangle of confusion that this relationship trauma had caused, and Sarah’s new place of abode forced Abraham into making new arrangements? It provides a fascinating insight into the way the whole community was responsible for taking these practical arrangements from the mourners, and for arranging the dignified care and disposal of the body of the dead. This mitzvah took over from the need to work for everyone in town. There was a notifying sound when someone had died so that everyone would know of the death, and clearly in some places that R.Hamnuna knew, this sound was the prompt to everyone to down tools and go to help. Yet in Daru-matha they were even more organised, having deputed the responsibility to a group of skilled volunteers, much as we do to this day. This leaves time for the mourner to use more than the 15 percent of time that Abraham was able to give in the narrative, to their grief. They can focus entirely on their loss, on the person they loved, on evaluating and processing and making sense of what has happened. And here Abraham has something very powerful to teach us. Lispod is the word we use for giving the hesped – for speaking of the dead and telling the story of their life, from where they had come and how the journey had been, assessing and evaluating the real life that was lived, rather than eulogising or praising the person- at least not paying fulsome tribute unrealistically or without the fuller context of the way they lived their life. ‘Hesped’ means to cause to cry – in other words to really understand who we have lost and so to really feel the cost and pain of the death. Only after Abraham has done this, comprehended the full meaning of the life of Sarah, and thus the full extent of his loss, does he cry/mourn. Sometimes when people die we like only to say good things about them – even unrealistic and unbelievable good things, instead of focussing on who they were, on why they had the damage or the pain or the anger they carried, on how they did or did not deal with the hurts and disappointments every life brings. There is a tendency to quote another midrashic gloss taken from the names of three sidrot in the book of Leviticus – “Acharei Mot Kedoshim Emor – After death speak holiness”. And this is a good maxim, but it is not the way of true mourning if we think the holiness /kedoshim means to tell ‘white lies’ or gloss over the reality of the complexity of every lived life.